There are, at least, three bands named Katzenjammer: 1. A folk group from Oslo, Norway 2. A British piano musical comedy duo 3. The original name of Kyuss 1) A folk group from Oslo, Norway. Mixing a variety of musical styles with multi-instrumentalism, the band consists of Anne Marit Bergheim, Solveig Heilo, Marianne Sveen and Turid J?rgensen. Most of their material is written by their friend Mats Ryb? ; however, the band also contribute songs written by themselves. Katzenjammer was formed by the four girls in 2005. They came to prominence NRK's "Ur?rt" project; a platform for up-and-coming bands and artists to showcase their material and win national exposure. They were also contestants on "Kjempesjansen", a Norwegian talent show. With their unique sound and exceptional live shows, Katzenjammer slowly but surely gained a reputation as an act to watch. In 2007, they held a concert at Norwegian Wood, a famous Norwegian music festival, as part of their Underwood line-up. The band eventually scored an underground hit with "A Bar In Amsterdam" and made it as far as the finals in Ur?rt's "Artist of the Year" awards. 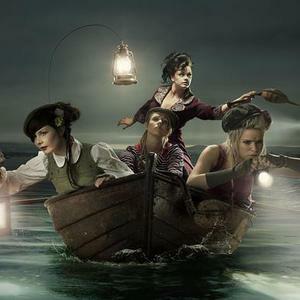 Early in 2008, Katzenjammer served as support acts for various other Norwegian bands including Kaizers Orchestra, who had openly supported the band. Throughout their career, they have often been referred to by the media as a female Kaizers Orchestra, as both bands are famous for their eclectic musical style and energetic live shows. They also made several TV appearances. In October of that year, they released their first studio album, Le Pop. The album received many good reviews and the subsequent tour helped build a fanbase. The album was released in international markets with an altered tracklist in 2009. Their second studio album, A Kiss Before You Go, is scheduled for official release on 9 September 2011. In anticipation of the album, the singles "When The Laughter's Gone" and "I Will Dance (When I Walk Away)" were released earlier that year. 2) A British piano musical comedy duo, since summer 2003, comprising two Royal College of Music graduates: Steven Worbey & Kevin Farrell. See: Katzenjammer.biz. 3) The original name of Kyuss.